I love a good green nail polish but I love good mint green nail polish even more, especially when the sun is out. 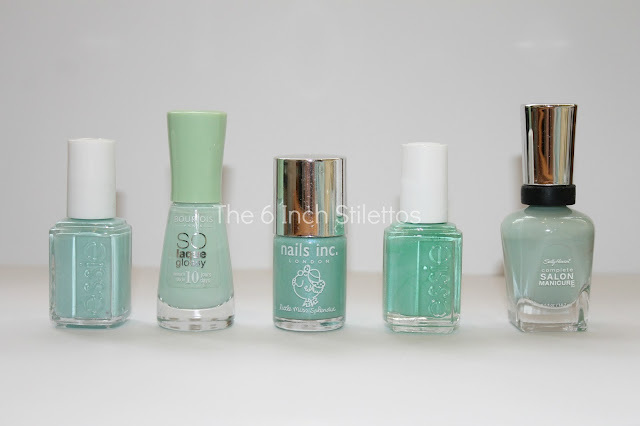 I don't know what it is about mint green nail polishes but they seem to be my weakness - well, all nail polish is my weakness - and I just can't seem to kick the addiction to buying a new shade of mint green. Whether it's more turquoise-ish or pistachio, if it falls in to that family then I am having it. Ahh, the green of the Gods. I have yet to find a girl who doesn't love this colour because it is the perfect mint green and looks bloody amazing when paired with a tan, might I add. It's a beautiful creme polish that is opaque in two coats and doesn't pool, drag or streak when faced with any of the elements. It's actually perfect. When my all time ultimate favourite mint green polish, OPI's Gargantuan Green Grape', died a gloopy death, I struggled to fill the void. This Bourjois number launched earlier this year and, although it hasn't replaced my love for OPI, it does come in a very close second. The brush like all other So Laque Glossy polishes is fab but the consistency does take some work. One streaky first coat followed by two additional thin coats give it a nice even finish which looks gorgeous. Having never been a massive fan of Nails Inc polishes - the lid is a faff to hold and they always streak on my nails - I wasn't sure about this number but it proved me wrong and gave me some hope for the polishes from the cult British brand. This sea green mint-ish polish is infused with light blue micro shimmer which isn't really noticeable unless you look really close but it does look really nice on and has adorned my nails a couple of times in the last month. I know some may not think this should be in the mint green round up but I think it's just a more vibrant shade of mint green, that may also fall in to the grass green category. I saw this countless times on Instagram and after I saw Nicola, of NicolaVC86, post a photo on her Instagram I knew I had to make it mine. It applied like a dream and only took two coats for a nice even finish, although I know some people have been able to get away with one coat because it's pretty opaque. After hearing that Poundland were selling through loads of Sally Hansen polishes, I hotfooted it down to my local shop and perused the beauty aisle with the vision of a hawk. Poundland can be a bit hit or miss with so many people having success, I was in it to win it. And win it I did. I picked up this mint green pretty for a mere £1 (obvs!) and couldn't think of a better bargain. The wide brush and easy to grip lid combined with the creamy consistency that didn't take a lot of effort definitely make this polish a clear winner of pure mint green amazingness. My top pics of minty fresh goodness in the form of polishes, all of which I would highly recommend if you're on the hunt for something of that colour. If you have any faves that I haven't included, drop a comment and let me know. I'm a lemming for a little bit of green. I had First Timer on my nails last week and loved it! I agree with you it's definitely a vibrant mint and I received a lot of compliments.